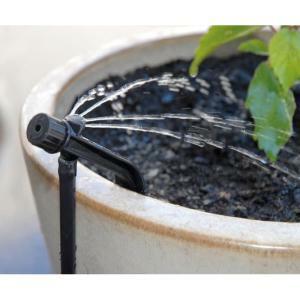 Antelco’s Potstream Adjustable Dripper is the perfect way to tidy up your drip system for potted plants. This adjustable dripper is uniquely designed to stay put inside your container with a sturdy 6” stake and the vertical barbed tubing connection is located on the outer side of your container to conveniently hide the micro-tubing. This dripper provides a gentle four stream watering pattern that is adjustable for all your needs. Used in conjunction with the Tidy Bow Elbow, your container drip system will always look nice and neat.